Hello stalkers! I am participating in what’s known around the world as Mission Monkey Day! What is Mission Monkey you ask? Well, there’s this blogger friend of ours known as Pixie Momma, aka Michelle. Michelle has a little girl, or Monkey as she’s known by, who was diagnosed with Neuroblastoma. To learn more about it, click here. Monkey is a sweet little 16 month old girl. She doesn’t deserve this. Nobody deserves this. But the good news is that Monkey only has Stage 1 (low risk). YAY!!!! The bad news is the medical bills are mounting and the Physical Therapy (starts today) isn’t covered by insurance. Michelle is using the donated money to offset medical bills. She will donate any unused portion to another family dealing with the same issue. 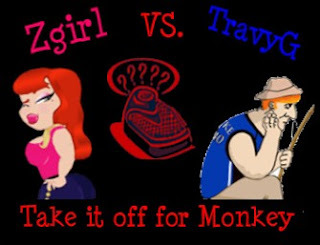 Click on monkey to donate! If you are donating money via PayPal, we need to know who it’s coming from. For example, look at the first picture below. The link takes to you this screen. Press the plus sign and then indicate your blog name/blog email address so we can track you accordingly. And, here’s the thing: this could be any of our kids. Thank you for your time and thank you for your donation. More info can be found here – CASH PRIZES!!!!!! Kerri over at Kerri’s Klutter is donating $1 for each and every linkup she receives for her weekly meme, Comment Love Letters. In addition, Adrienne is matching Kerri’s donation dollar for dollar! Go and link up and support Mission Monkey! Jenn over at BabyStepsInHighHeels has a challenge where she’s going to donate $1 for every comment/new follower from now until the end of May. Please visit her! Link up your Mission Monkey posts here! Also head on over to lend some prayers and support to Daffy. This is such a great cause! Monkey looks like such a little sweetheart. Nobody should have to go through what she's going through. It's so heartwarming to see all th support for Monkey. I truly appreciate your support & love for Monkey and me. Thank You! So happy to see bloggers coming together to help this beautiful little girl and her family. 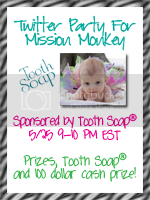 Hope you'll be able to stop by our blog hop benefiting Monkey. We;re donating $1 for every blog that links up or everyone that stops by and leaves a comment.